With Easter merely weeks away, why not take some inspiration from the season and decorate your home with spring-like shades and pretty pastels? A celebration of new life and rebirth, Easter is the perfect time of year to incorporate delicate spring tones into your home. Take your cues from the blossoms that will be adorning trees across the country – delicate pinks are abundant in nature, so think about using them in your home if you want to create a comforting and feminine feel in your home. Aside from dusky pastel tones, other colours to go for include greens of all descriptions, as well as yellows, creams and blues. Anything that evokes a ‘fresh’ feeling, or mirrors the colours and hues you see outside during this time of year will work really well. The best thing about shades and tones such as these, is that even though they’re perfect for this time of year, they’re versatile enough to look on-trend throughout the year – being the perfect balance between the more muted tones of winter and the brights of summer. Think about choosing louvered style shutters too – with the clocks going forward and the days getting lighter and brighter, it’s good to let in as much light as possible after all the darkness of winter! 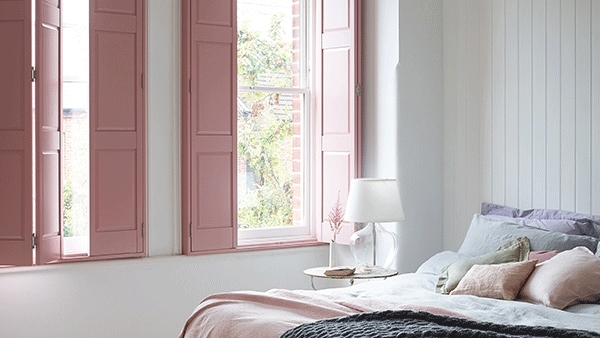 Louvered shutters will allow you to control the amount of light you let in, as well as enabling you to show off the gorgeous colours on your shutter.